Adam and Eve were made very happy with the birth of children. But, bitter disappointment came when their son Cain, killed another son Abel. Cain became jealous and very angry when God burned up Abel’s sacrifice of a lamb, but not his own sacrifice of fruits from his garden. God wanted the animal burned as a symbol pointing to Jesus future death for man. But, Cain offered God the produce from his work. He wanted to earn favor or merit with God. 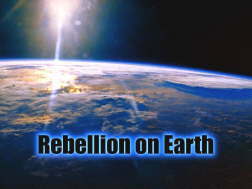 This – trying to save yourself by your own labors or good works, became the heart of all false religions. This story also became an example of the hate that many people would later have for the people who trusted in God completely for salvation. God considered destroying man completely, but God's plan for saving man was not complete. Jesus had not come yet. God’s plan to show His love to the Universe was not finished. God decided to re-start the world again. God would provide a test of faith, loyalty and obedience for everyone living. Those who passed the test would be saved. God would destroy their beautiful world with a flood. But, God would lovingly provide a way of escape in a huge boat, the ark. That boat would be an ark of safety for those who believed. 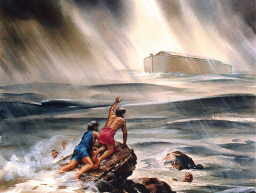 God saw that one man (Noah) had enough faith that He could be trusted to build the huge boat. God talked directly to Noah and gave him the plans for the boat. The boat would be about 450 feet long, 75 feet wide and 45 feet high. It must be big enough to carry pairs of all animals and birds. After the flood their babies would then again slowly fill the earth. Noah and his family, and some friends, worked hard on the huge boat. 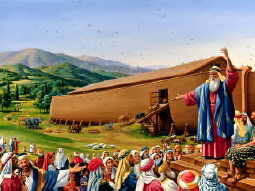 Noah worked and preached for 120 years. Most of the people laughed at him. The scientists said that a flood was impossible. God had watered the earth daily with a heavy early morning mist. Rain had never fallen from the clouds. Many people thought Noah was crazy. When the boat was finished, a miracle happened. From everywhere came animals and birds, all guided by an unseen hand. The "clean animals" came by "sevens" and the others came in pairs. Perhaps, for a little time, the people stopped making fun of Noah. This was amazing. But, when Noah made his final appeal to go inside, for the flood was coming, only his family of three sons and their wives went in with Noah and his wife. Then an angel came, and shut the door. Some may have thought they could "save themselves" by their own plans. It didn’t make any difference if the people left outside were sincere or if they really would like to follow God. If the people did not obey and go in, it was too late! Nothing happened the day the angel shut the door. People started to feel better – the memory of the animals miraculously going in the ark began to fade. The crowds began to cheer and tease the family inside. Six days this was repeated. Perhaps God was also testing Noah’s belief. Would God do what He promised? Finally, on the seventh day, the flood came. Water came from everywhere. It came in huge amounts from the sky and it came up out of underground sources. The wind and the waves were so terrible, that it must have made Satan scared for his life. 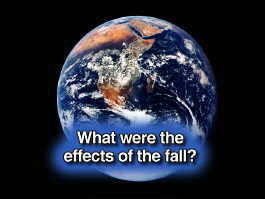 The Bible says that the waters reached to the top of all the pre-flood mountains. It took five months of floating back and forth before God brought the boat to rest on the mountains of Ararat. [probably on the borders of Turkey and Armenia]. Some Creation scientists believe: that it was at this time that God moved the continents around; that some land went down; that other huge mountains were pushed up to the height of Mount Everest. The world would never be the same again. God changed many things. Now there would be rain and snow, very hot areas and very cold areas. Man would have new challenges and his life would be shortened to around 100 or so years. God took his time to settle the waters and do all He intended to do with the earth. It was just over 12 months before God finally gave Noah permission to leave the boat. What a relief they must have felt! But, this was not the beautiful earth they had left one year before. The earth looked so different, so rocky, and now there were large areas of water. How wonderful if they had "all lived happily ever after". Both Noah and his son Ham made some serious mistakes. But, God does not give up! God works through men who still trust Him enough to love and obey Him -- even if others choose to rebel. Go to the Next Section: God Continues to Work with Man.